Lenovo ThinkPad Tablet leaks out with Honeycomb, IPS screen, optional stylus and keyboard folio? 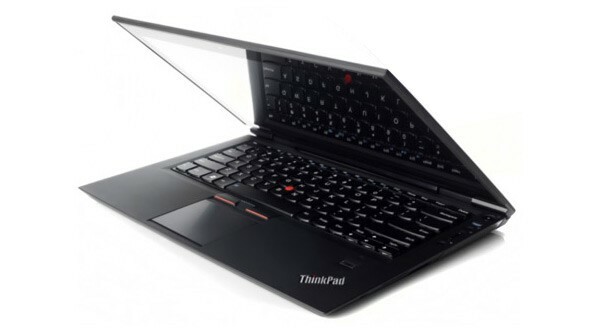 Remember the ultra-thin Lenovo ThinkPad X1 we detailed just a few hours ago? The document that dished those secrets also mentioned an “X Slate,” which made us wonder if Lenovo’s LePad was finally hitting the states… but This is my next seems to have stumbled across a far grander piece of technology than that oft-delayed slate. 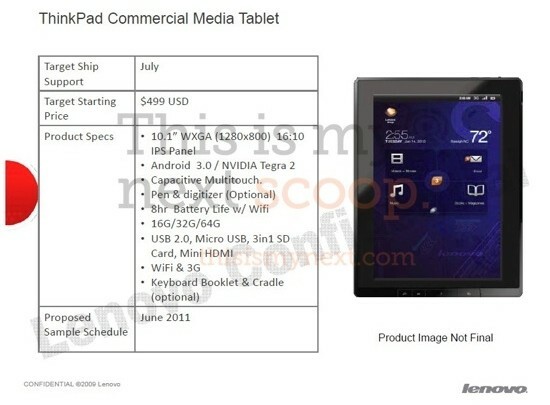 According to a presumably leaked company presentation, Lenovo’s planning to release an Android 3.0 tablet this July with a giant raft of specs — a 10.1-inch 1280 x 800 IPS capacitive multitouch panel, a Tegra 2 processor, up to 64GB of storage, front and rear cameras, a full-size USB 2.0 port, mini-HDMI out, a genuine SD card reader and up to 8 hours of purported battery life in a package about 14mm thick and weighing 1.6 pounds. What’s more, it will reportedly have an optional dual-digitizer with “true pen support” and an optional keyboard case, possibly aping ASUS’s recent Slate and Transformer tablet input mechanisms by allowing for either or even both as options. There’s also apparently plenty of software support for the business-minded, including IT integration as well as anti-theft and remote wipe options, and all this will apparently start at the competitive price of $499 — assuming these documents are legitimate and still valid. You see, they look a little preliminary for a slate supposedly sampling in just a couple of months, and there are contradictions here and there, such as the mention of a 1080p display in one slide, and some watermarks from 2009 in others. Still, Lenovo, if you’re indeed producing a tablet today, we’re liking its proposed specs — don’t suppose we can get a Tegra T25 chip while you’re at it? Find a few extra renders and plenty of slides at our source link. Lenovo ThinkPad Tablet leaks out with Honeycomb, IPS screen, optional stylus and keyboard folio? originally appeared on Engadget on Sun, 24 Apr 2011 17:05:00 EDT. Please see our terms for use of feeds. The scientific community has spent a decade exploring ultrasound as a means of breaking through the blood-brain barrier — a layer of tightly-packed cells that surround the brain‘s blood vessels, making it difficult for doctors to deliver chemotherapy and other treatments to cancer patients. Thus far, though, most ultrasound-based techniques have relied upon complex and often costly equipment, including MRI machines and infusion pumps. But researchers at a startup called Perfusion Technology think they may have come up with a less invasive, more cost-effective alternative — a new headset designed to deliver low-intensity ultrasound therapy to the entire brain over the course of extended treatment periods. This approach differs markedly from most other methods, which typically target smaller areas of the brain with high-intensity ultrasound doses. As with most other potential breakthroughs, however, Perfusion’s technique still needs to undergo some major testing. The company has already conducted several tests on animals, but the last time a similar method was tried on humans, many subjects ended up suffering from excessive bleeding. And that doesn’t sound good at all. Startup’s headset will bathe your brain in ultrasound, might help fight cancer, too originally appeared on Engadget on Sun, 24 Apr 2011 15:16:00 EDT. Please see our terms for use of feeds. Yesterday’s speculation has turned into today’s fact. The ultraslim Lenovo ThinkPad X1 is most definitely real, coming soon, and just so happens to be packing some fancy new battery technology as well. This intel comes straight from Lenovo’s own servers, where a highly informative PDF (intended for reseller partners, but accessible to all) dishes the dirt on the upcoming laptop. The X1’s “slice” battery won’t be user-replaceable, but what you lose in flexibility will be made up for in sheer performance gains, as Lenovo is touting it’ll last three times as long as a normal battery and will recharge 2.5 times faster than previous ThinkPad cells. That’s thanks to some fanciness named RapidCharge that will revitalize the X1 to 80 percent within 30 minutes. The presentation slides show the X1 right alongside Lenovo’s latest Edge models, the E420s and E220s, as part of “a new generation of ThinkPads,” and given that both of those are now shipping, the ultraslim, but still unannounced, X1 can’t be far behind. Finally, just for some added intrigue, we’ve also spotted mention of an “X Slate” within the document — any ideas as to what that might look like? Lenovo ThinkPad X1 confirmed, faster-charging integrated battery detailed originally appeared on Engadget on Sun, 24 Apr 2011 13:33:00 EDT. Please see our terms for use of feeds. This entry was posted on April 24, 2011, 5:35 pm and is filed under Mobility. You can follow any responses to this entry through RSS 2.0. Both comments and pings are currently closed.